There were many moments from last night's White House Correspondents' Dinner which were noteworthy from a nonverbal communication point of view. 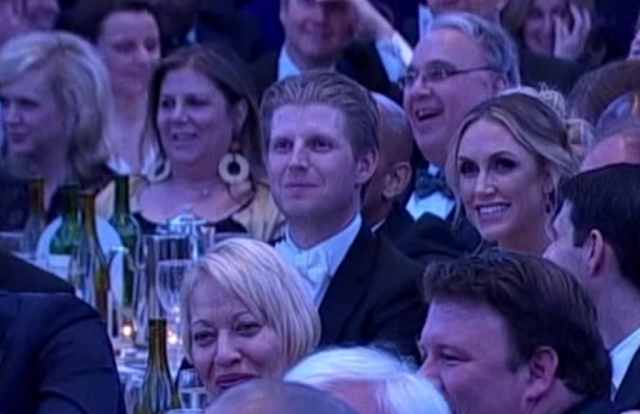 What follows is but one of those - this one involving Donald Trump's son, Eric - who was in attendance. Continuing at 20:30, President Obama continues: "..... Nah, I'm just kidding! You know I'm going to talk about Trump. Come on! We weren't just going to stop there. Come on!" Then the camera flashes on Eric Trump, pictured here in the center of the image below (20:53). Note his lips - they are both thinned and horizontally oriented. In addition, he is displaying significant mid-facial tension and nostril flaring. This nonverbal cluster is a highly reliable signal for anger. The vast majority of people will not see or misinterpret this crucial body language sign. Nonverbal Communication Analysis No. 3522: Felicity Jones in New Star Wars Trailer: "Rogue One"